SAGE Centers are accessible, inclusive and welcoming gathering places throughout New York City. 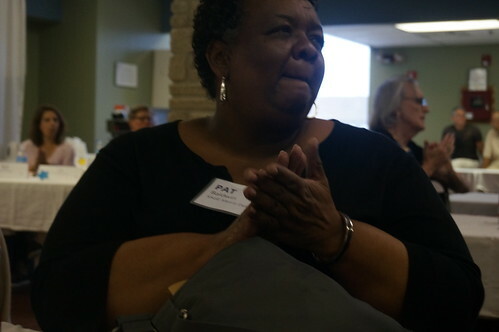 Here are the faces of our SAGE-GRIOT Innovative Senior Center community. The SAGE-GRIOT Innovative Senior Center, located in downtown Brooklyn, is a partnership between SAGE and GRIOT Circle, an inter-generational, culturally diverse community based organization which has served primarily LGBTQ elders of color in Brooklyn for nearly twenty years. This unique collaboration allows both organizations to expand and work together to provide emotional support, social connections, and a wide variety of programs and services for older adults. SAGE-GRIOT Innovative Senior Center of Brooklyn is located on 25 Flatbush Ave., 5th Floor, Brooklyn, NY 11217. The building is located on Flatbush Avenue between Fulton and Livingston Streets. Take the 2, 3, 4 or 5 train to Nevins Street or the R or B to Dekalb (wheelchair accessible station). Contact us at 718-246-2775. Click here for a map of the location.